The frieze in the Grand Hall was painted by Belgium artists shortly after the Boer War. We now know that the frieze was not complete when the Bonnetmakers and Dyers held their 306th anniversary in October 1903. 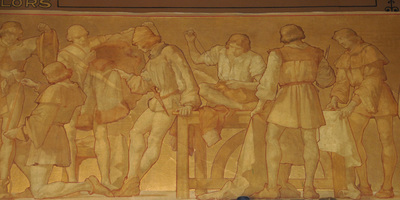 The frieze depicts the fourteen Incorporated Crafts in a historical romanticized style and is 64 metres (210 feet) long. There are 161 people depicted in the frieze and we can only find four females in the frieze. To find the ladies it is important to realise that the ladies did not show their less. Try looking in the Barbers, Cordiners and Fleshers. Along with the 161 people there is one cow, one donkey, two sheep and two pigs. The Fleshers have most of the animals and the Gardiners have the donkey.